App ribbons are how Method Apps "talk" to one another – they display related information from a different app and serve as a shortcut directly to that information. In the below example, we have created an app that keeps track of a contact's pets. The information from that app is put in the Contact's app ribbon. The Pets App Ribbon on Amy's profile shows us she has three pets. Clicking the tile lists out all her pets. Clicking on a pet will take the Method user to the Pets App, specifically to the pet they clicked. This is a perfect illustration of how app ribbons can leverage relationships between other apps, which helps streamline your Method experience and give you more control over the information you’re expressing in individual apps. To illustrate how app ribbons work, we will go through the example displayed above. In order for App Ribbons to function, a relationship must exist between the two base tables of the app. In the above pets example, there needs to be a relationship between the Contacts table and the Pets table in order for pets to appear in the Contact's app ribbon. Specifically, the pets table must have a dropdown field of Contacts. Note in the below diagram, the Pets table (called eduPets) has a dropdown field called "Owner" which pulls from the Contacts Table. To learn more about dropdowns and how they create relationships between tables, see Field Types. The trickiest part of setting up an app ribbon is figuring out where to configure it! If you want pets to show up in the Contacts app ribbon, do you manage the Contacts App or the Pets App? The answer is the Pets App. You will need to go into the manage screen of the Pets App and configure its records to show up in the Contacts app ribbon. Imagine it like granting permission to the Contacts app to see pets, and only the source, the Pets app, can give that permission..
To clarify, if you want records to show up in an app ribbon, you do NOT configure the App that holds the app ribbon. You configure the App that holds the records. In the following example, we will show pets in the Contacts app ribbon. Note: Remember, eduPets is a custom table, and thus a custom app would have been created for it. If you are looking for either this table or this app, it won't exist in your account. This is only used as an example. Substitute "Pets App" with your own app. Click the vertical ellipsis ( ⋮ ) on your custom Pets App, and select Manage. Click the box labeled Create App Ribbon. Step 1: Specify how this app’s base table relates to tables in other apps. Show how the Pets table relates to the Contacts table. eduPets Fields: Select the dropdown field which references the Contacts table. This was named 'Owner' in eduPets. Join to Table: Since we want the pets to show up in the Contacts App, we will need to choose the base table of the Contacts App, which is the Contacts table. 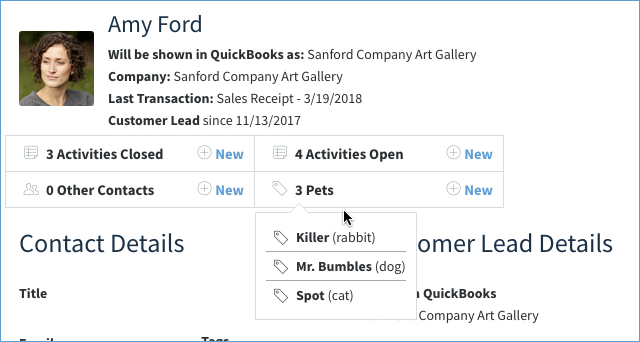 See how the Owner dropdown field connects to the Contacts table via the RecordID (which is in brackets). This is the field we are joining on. It is the field that joins the Pets table to the Contacts table. Step 2. Set up what your ribbon tile will display. In our example, we want the pets tile to display the number of pets the contact has. Value lets us choose how the number will be expressed – “Count” displays a total number of pets. In other cases we might choose Sum, Avg, Min or Max. Aggregate Field: this is the field we are calculating the value on. For a "count", the RecordID field is usually chosen. The Caption is the title referencing what the number is displaying. Type “Pets” here since we are displaying the number of pets. Step 3. Set the order and number of records to display. Order sorts by ascending or descending values. Step 4. Apply additional filtering. This option allows you to filter the displayed records in more advanced ways. See the Criteria Builder for examples on how to use this. When you’re finished with your changes, click Done to save. Your app ribbon is set up, however, there are few more things left to do. After you have set up the app ribbon, you'll need to set up what it looks like in the app ribbon. You set this up within the app's Record Summary. The below steps will continue our example of using the Pets App. Click the vertical ellipsis ( ⋮ ) on your custom Pets app and select Manage. On the left menu, click Record Summary. Within the Record Summary screen, click the box labeled Default Summary. 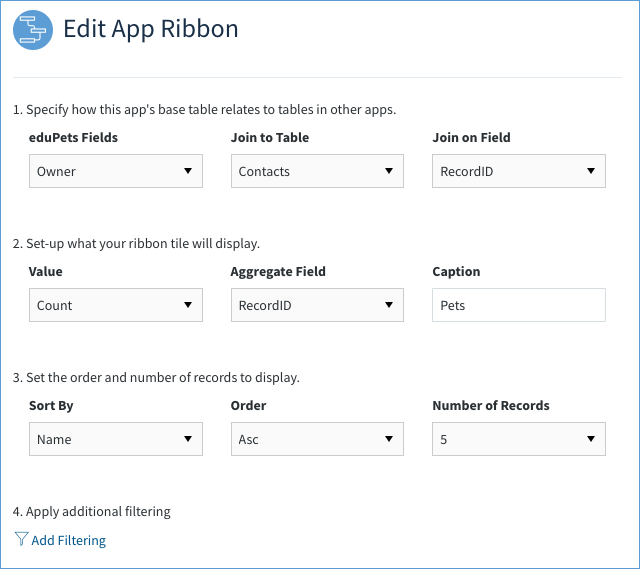 Click ⊕ Add Another Item to add fields to show up in the display of each app ribbon record. When the user selects the ⊕ New link, or an individual record in the app ribbon, they will be taken to a screen within the app. For example, selecting ⊕ New on Pets will take them to the New / Edit Pet screen within the Pets app. This is set up within the General section within your custom app. Screen for New Records - Screen the user will be taken to when they select ⊕ New in the app ribbon.